My five year old daughter has started learning piano through Groove n Move School of Music at Coorparoo. Their recommendation is to just buy a cheap $100 keyboard from Target or Big W to get the child started. Sensing an opportunity to get another musical instrument, I did a little research and decided to purchase a Casio CTK-3000 digital keyboard/electric piano. 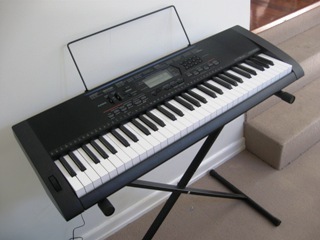 I bought it off eBay including a keyboard stand and AC adapter from Strathfield Music for A$289 plus A$35 postage. Delivery was super fast from Strathfield Music — they were a pleasure to deal with. The Casio CTK-3000 was the cheapest model keyboard I could find with touch responsive keys. That is, press keys lightly and the keyboard plays quietly, press hard and the keyboard plays loudly. Actually, the Casio CTK-810 was cheaper and had touch response, but it was silver in colour; I wanted a black keyboard. The sound quality for many of the tones from the CTK-3000 is excellent for the price paid. To my untrained ear, it really does sound like a grand piano in my living room! While the piano, string and percussion tones are generally good to excellent, the tones for wind instruments leave a lot to be desired. Quite frankly, I would not use them. I am not sure that I am ever going to use the built in rhythms, but there are plenty there that my children are happy to boogie to. And the built in songs? Well I find them a bit cheesy too. Quite frankly, the backing tracks are a bit try-hard. While we are on the negatives, two more. 1) Sometimes the key action is not smooth, giving a kind of grating feeling. And it is not always the same keys. Go figure. While not a problem that affects the sound quality, it does diminish the tactile experience of the keyboard. 2) Some of the bass tones make the keyboard rattle. I have never had a problem with piano tones, but bashing away at the keyboard with the slap bass tone cranked up resonates through the keyboard making it rattle. Again, not a big deal given that the primary tone I use is grand piano; the rest are just novelty features for me. A few of my friends/family play keyboard/piano, so I am keen to get their opinion on the Casio CTK-3000. This entry was posted in Other instruments and tagged Music, Review on 15 May 2009 by Rex. does this one have a “clavinet” tone within its many functions?? Im thinking of buying one if it does, i jst need this function..
Not sure about a “clavinet”. The Casio CTK-3000 certainly contains three or four “clavi” tones, but I am not sure how accurately they reproduce a “clavi” sound. If you can find one of these keyboards in a shop, try tones 024 to 028 and tone 274. Here’s my advice : don’t ever use ebay for musical instruments. There are a lot of music retailers out there who offer quality services and really good prices. You could have got the package you just described for as less as $149.95, and probably free shipping. I usually go for zzounds.com or musiciansfriend.com , but you can just google whatever product you need and be sure that you’ll get the best deal under shopping search results. actually, for $149.95 you’ll get some headphones too, along with the stand and the ac adapter..
Good advice to shop around. However, my prices are Australian dollars; the prices you are quoting are US dollars. The price (including freight) was the best that I could find at the time using Google, shopbot.com.au, shopping.com, eBay, etc. Be ware——-you get what you pay for.!! I’m having a hard time deciding between this keyboard and the Yamaha PSR-E313 (or the newer E323). I think I am leaning more towards the Yamaha. Finding out that the CTK-3000 only contains 2 levels of touch sensitivity (from what I read) really put me down. I believe Yamaha’s grand piano is a lot more rich. The only downfall of Yamaha’s PSR-E313 is that it doesn’t include a USB port, but has a MIDI port instead. hey, can u explained what do u mean by two types of touch response? cause i am planning to buy a ctk-2100,and the details on the web showed that they do have 2 types of touch response, so does it mean that ctk 2100 has touch sensitive keys? Pretty good post. Really enjoyed reading your blog posts. Further reading has revealed all it means is it has two levels of touch SENSITIVITY to choose from. A detail completely irrelevant to most people. The keyboard is a proper touch sensitive response type, perfect as a cheap midi controller to plug into a laptop, making the inbuilt sounds irrelevant. keys on the piano increased as composers began to demand more complex repertoire.